HomeNew ReleasesKylie back with BANG! week later, on July 5.
really excited to hear what everyone thinks of it". pop dance music at her best." The 'Power To The Peaceful' Festival has become a yearly tradition and inspiring event for Michael Franti & Spearhead and their cast of tens of thousands, who meet up for music, peace and good times at the Golden Gate Park in San Francisco, CA. 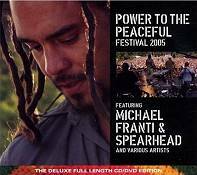 This new deluxe movie CD & DVD release truly captures the excitement of the annual 'Power To The Peaceful' Festival. "Right now, people ask me, what can one person do to change what's going on with the world? My role is as a storyteller and a songwriter. I'm somebody who is trying to keep the spirits of other people up, despite all the chaos and fear around us." You too can now experience what the multitudes of fans have felt, with this amazing soundtrack CD and deluxe full length movie from this incredible event. Featuring some of Michael Franti & Spearhead's most loved songs like 'Everyone Deserves Music', 'Yell Fire' and 'Is Love Enough'. This important new release is an event not to be missed… POWER TO THE PEACEFUL! 7": Monday 7th September – Jet, the Australian rockers, will release their third studio album 'Shaka Rock' on their newly created Real Horrorshow Records. Shaka Rock was recorded between Miami, Brooklyn, Austin, Sydney and Melbourne, with the band working side by side as co-producers with Chris 'Frenchie' Smith to ensure that Shaka Rock would live up to their own expectations. Having established themselves on the international stage as a multi-platinum selling band with 4 million albums sold world wide, 'Shaka Rock' closes the gap between the raw roots of 'Get Born'  and the grace and melody of 'Shine On' . 'Shaka Rock' captures the charisma and energy of classic rock and roll with just enough swagger and contemporary flair to create something distinctively Jet. When talking about Jet's three studio albums, Nic Cester says, "For better or worse every album is a real and accurate window into how we are reacting to our lives in that point in time which is why every album is uniquely different, and I think Shaka Rock is the most honest so far." While Chris Cester says, "I can say that the band is thrilled with Shaka Rock in every conceivable way. We've had a don't think twice attitude throughout the making of this record which continues as we get ready to release it. I think 'Shaka Rock' is like when TV went colour. It's our musical equivalent. There are moments on this record that are just pure…and moments that just rock harder than we ever have before." 'She's A Genius' will be the lead single from Shaka Rock and will be premiering on BBC Radio 1 with Zane Lowe on 7th July and available both digitally and physically from August 24th. In a sea of modern rock bands, Jet are something uniquely different embracing all that was and is rock n roll. Kylie perform and looks best in her life!